Meet at the Vertiport Chicago and board a state-of-the-art helicopter to begin your helicopter tour. Admire wonderful views of Lake Michigan, with Navy Pier stretching across the water and picturesque Lincoln Park lining the shores. 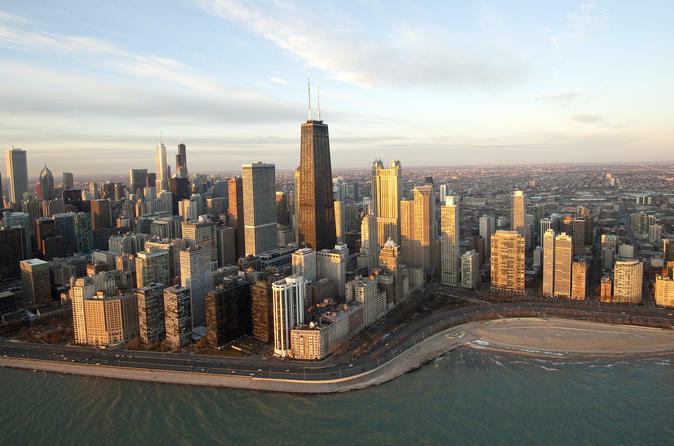 See iconic skyscrapers like Willis Tower (formerly Sears Tower), Trump Tower and the John Hancock Building, and soar past main Chicago sites like Soldier's Field, United Center, Grant Park, the Lincoln Park Zoo, the Shedd Aquarium and the Field Museum. Marvel at the masterful beauty and architecture of Millennium Park, designed by world-renowned architect Frank Gehry -- a landmark that can only be truly appreciated by air. With your two-way audio headset, your pilot will provide expert commentary about all the sights you see, and will be available to answer questions you have throughout your helicopter flight. Plus, your helicopter is heated, making this tour great for any time of year!